Copies of AKC registration certificates, thereby verifying that both the sire and dam were over 2 years old at the time of breeding. Health reports, publicly available in an online approved database such as OFA. Eye clearances (CERF certificates) on both the sire and dam, issued by a veterinary ophthalmologist certified by the American College of Veterinary Ophthalmologists. Clearances must be current at the time of breeding. Eye clearances on dogs are valid for only one year from the date of exam. Hip clearances on both the sire and dam. Dogs must have final OFA certification or PennHip evaluation, done at or after 24 months of age with no radiographic evidence of hip dysplasia. Elbow clearances on both the sire and dam. Dogs must have final OFA certification at 24 months of age or older. Final heart clearances at 12 months of age or older on both the sire and dam, issued by a veterinary cardiologist who is certified by the ACVIM (Cardiology). A litter listing agreement, completed and signed, for each litter listed. There are no listing fees. Referral listings will run for 10 weeks; please contact the Breeder Referral chair to pull or extend the listing. Yankee recommends that a fully executed, written purchase agreement setting forth all the terms of purchase be obtained before possession of a puppy is transferred to a purchaser. 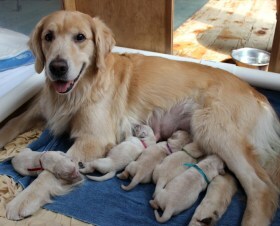 Litters listed with the Breeder Referral service are also listed in the Finish Lines newsletter. Please note: Yankee members who own stud dogs may list litters sired by their dog when the breeder is not a YGRC member, provided the same listing criteria have been met by both sire and dam. The Yankee member must be the contact person for the Breeder Referral listing. Acceptance of a listing does not guarantee placement of puppies, and does not constitute endorsement by YGRC or any of its members. Neither the Yankee Golden Retriever Club nor its Board of Directors assumes responsibility for the quality, health, soundness, or temperament of any litters listed. Print a litter listing agreement form or copy the form below into a word processor. the undersigned agrees to indemnify and defend Yankee Golden Retriever Club for and against any and all liabilities, claims, demands, causes of action, damages, and costs asserted against and/or imposed upon Yankee Golden Retriever Club which are in any manner connect with the forgoing breeding. The undersigned certifies that he/she is a member of Yankee Golden Retriever Club in good standing and has been a member of Yankee Golden Retriever Club or another GRCA-member club for a minimum of one year. The undersigned agrees to follow the Yankee Golden Retriever Club Golden Rules and the GRCA Code of Ethics guidelines. The undersigned agrees to make all health reports (hips, elbows, heart, and eyes) on the above dogs available in an approved online database such as OFA (www.offa.org). Please remember to tell your puppy owners about Yankee's puppy kindergarten classes. Feel free to print a brochure to include in your puppy packets.